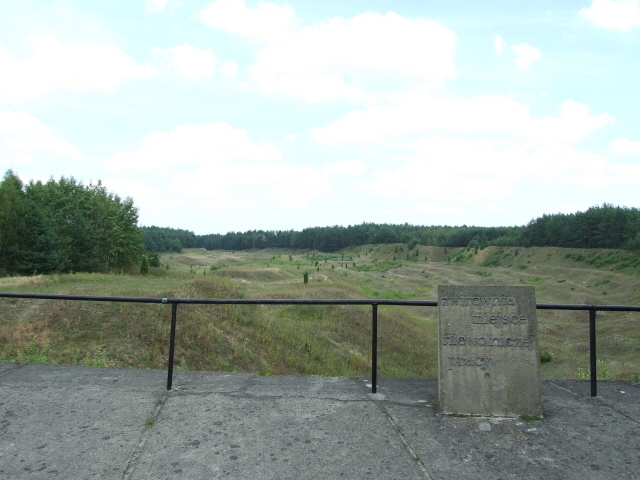 One of the three death camps in Poland (together with Belzec and Sobibor) of the Nazis' Operation Reinhard: the 'Final Solution", that is: the systematic, industrialized murder of the European Jews. And Treblinka was by far the deadliest of these camps. In fact, this is one of the grimmest places in all of human history! Treblinka's death toll of close to a million is "surpassed" only by Auschwitz-Birkenau. The latter, however, was in operation significantly longer – so in relation to the short time frame of its existence, Treblinka must be the site of the biggest systematic mass murder ever! Like the other two death camps that were just pure killing factories (i.e. 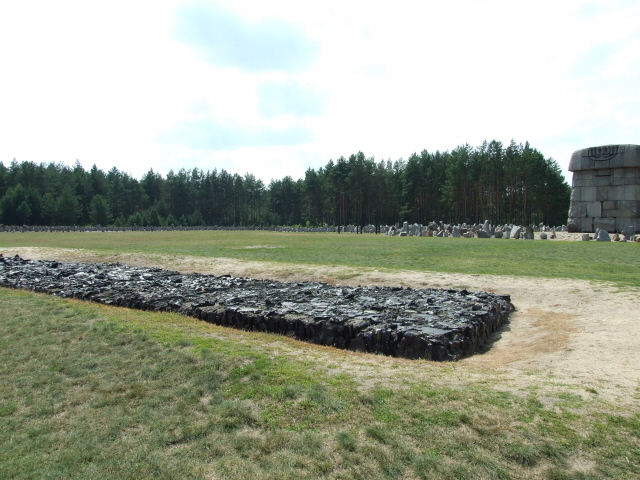 not concentration camps), Treblinka, was completely razed to the ground after completion of its gruesome task, and planted over for additional camouflage. Today's memorial site is thus largely symbolic and abstract. But still, given its significance, it is one of the most taxing places for a dark tourist – or anyone – to visit. More background info: The purpose-built death camp of Treblinka, officially Treblinka II, was in operation by July 1942. It was built by inmates from the labour camp of Treblinka 1 that had been established near the eastern Polish village of the same name the year before (primarily for non-Jewish Poles). Treblinka II was a pure killing factory covering a relatively small area of little more than 500 x 600 yards, with only a few buildings (no rows of barracks here, as in the concentrations camps). It was the last of the three "Operation Reinhard" death camps (after Belzec and Sobibor) to become operational but it was to even "outdo" them in deadliness. The final death toll is somewhat uncertain, given the speed of the operation and the fact that no proper, accurate records were kept. The minimum estimates range between 700,000 and 900,000 – but it could have been even up to a million. The victims were almost exclusively Jews: over 99 %; but there were also a few thousand Roma victims. This included almost the entire Jewish population of Warsaw, plus hundreds of thousands from other parts of Poland and beyond: several thousand Jews from Theresienstadt, Slovakia, Greece and other places were sent to Treblinka too. Whatever the final death toll may have been, it is clear that Treblinka was the most "effective" of the "industrialized" killing machines that the Nazis set up for their "Final Solution" that had been decided on at the Wannsee Conference in Berlin in January 1942. As at the other two such camps, victims arrived in freight train carriages. These normally had to be split into two to three sections as Treblinka's small railway sidings could only handle up to 20 carriages at a time. The death-bound "cargo" arrived usually after several days of agonizing travel in the most dreadful conditions. As a result, up to a third of the new arrivals would already be dead or dying when the doors finally opened at Treblinka. Those capable of moving were quickly whipped into a sorting square where they were told that they had arrived at a transit camp, from where they would travel on to other places, but only after a shower and disinfecting of their clothes. All this was of course just an illusion created in order to make the masses of victims easier to "manage". There was no showering, no further deportation. Treblinka was the end. Men and woman and children were separated and forced to undress. Meanwhile working units, "Arbeitskommandos" of inmates had to clean out the railway carriages so that they could be taken away to make room for the next batch, while other "Arbeitskommandos" had to clear away the new arrivals' possessions into storerooms, where suitcases, clothes etc. would be looted and prepared for transport to Lublin, from where these "materials" would be distributed for further use. Personal documents were destroyed. Eventually, even the women's hair was taken – which was also "reused" as a "raw material" by the Nazis (cf. also Auschwitz). 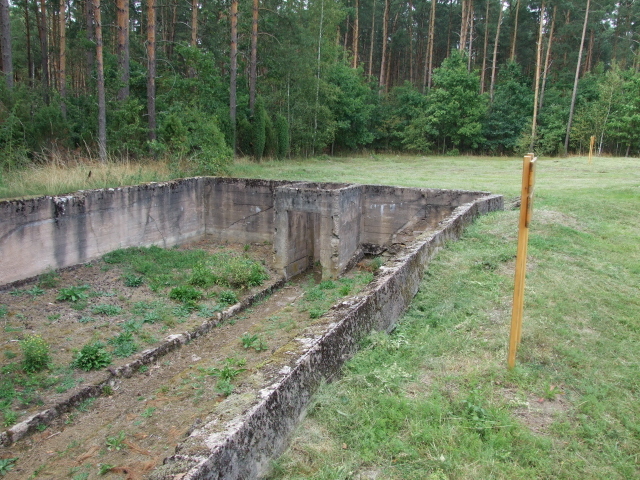 The naked victims would then be herded into the central death trap of Treblinka; first into the "Schlauch" (literally 'hose' or 'tube', or more figuratively 'funnel'). This was an open passageway, with high walls on either side, which led straight to the gas chambers. Or rather: not straight but in a 90 degree bend. That way the entrance to the gas chamber building wasn't visible until victims were already deep into the "Schlauch". Furthermore, the stream of people could be interrupted before the bend, to allow time for clearing out the previous "batch". As in Belzec, the gas used in the chambers was carbon monoxide exhaust fumes produced by specially installed engines (but not Zyklon B, as in Auschwitz or Majdanek). The gas chambers installed initially soon proved inefficient, so the complex was rebuilt and expanded to a total of 10 gas chambers in which 5000 or more victims could be murdered simultaneously at any one time. The gassing itself would take a torturous 20-25 minutes. After that, specially selected Jewish inmates, the so-called "Sonderkommandos" ('special commandos'), had the gruesome task of removing the corpses from the gas chambers and cleaning the chambers for the next batch of victims. The corpses were initially buried in gigantic mass graves – later, in an attempt to cover up the mass murder, they were cremated. The previously buried corpses were eventually cremated too. 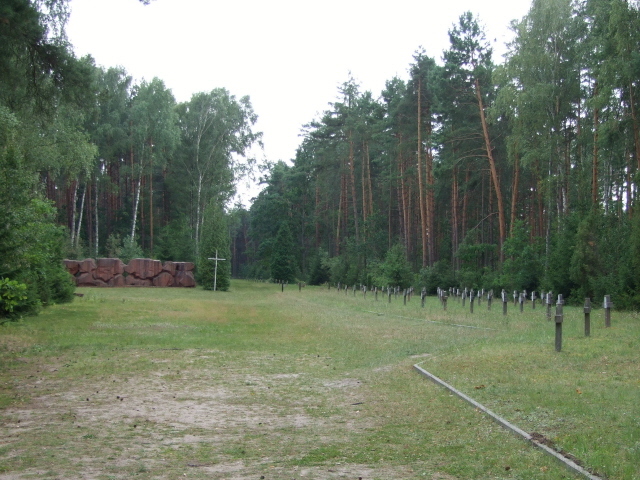 The "Sonderkommandos" had to exhume and then burn them on makeshift racks made from railway tracks (there were no crematoria at Treblinka). Each "shift", from arrival of the trains to burial/cremation of the corpses would take just a few hours. At peak times up to 17,000 people per day were killed and "disposed of" in this manner. A greater horror is hardly imaginable. Those too weak to be marched to the gas chambers were instead taken to a make-believe "Lazarett" ('sickbay' or 'infirmary'), which was even marked by a red cross flag (the cynicism of the Nazis really knew no limits). But beyond the fence and the maze-like entrance, which prevented a view of what lay within, was just another pit for corpses. Here victims would be shot through the neck by two SS men. The whole machinery was operated by just a handful of 20-25 German and Austrian SS men, assisted by ca. 120 Trawniki guards (mostly Ukrainians). The really "dirty work" was left to specially selected groups of victims, in particular the "Sonderkommandos". All in all, some 800 inmates were housed on the premises as such working prisoners. Initially, they would be regularly "exchanged", i.e. murdered and replaced by newly selected victims from the incoming transports. Later, camp commander Stangl decided to rather keep established "tried and tested" commandos for longer periods. This opened up the chance for a resistance movement to form. When suspicions arose that the camp was nearing the completion of its task in summer 1943 – and it was clear that the end of operations at Treblinka would also mean the murdering of all witnesses – a revolt was plotted. On 2 August this was put into action. By means of a duplicate key, some inmates were able to equip themselves with weapons from the SS armoury, set a few buildings on fire and in the ensuing chaos a mass escape was attempted. Even though the majority of escapees were killed, mostly by machine-gun fire, some 60 of them eventually made it to freedom. It was only through some of these survivors that the inner workings of Treblinka became known to the world after World War II. Following the revolt, operations were soon brought to a halt, and after only a few more transports had been sent to Treblinka, work began on dismantling the camp in November 1943, again using inmates from Treblinka 1 as well as a "Restkommando" ('residue commando') from Treblinka II. Not surprisingly, these were also shot after their work had been done (or sent to Sobibor, before operations there stopped too in the wake of the revolt at that camp). Apparently, however, people from the surrounding villages did have an idea of what was going on here, despite the heavy camouflaging of the camp. Some are said to have bartered with guards for victims' possessions. And after the camp's liquidation, some people had apparently tried to dig around on the premises looking for leftover valuables. Today, the site of the memorial is so "clean" that it is difficult to imagine what happened here. 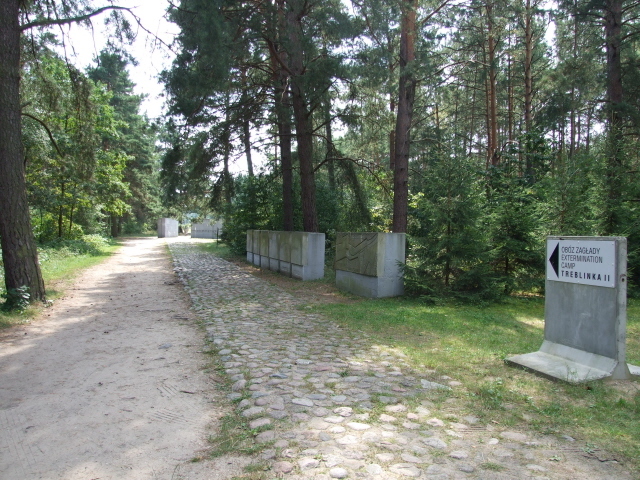 Still, the thoughtful layout and design of the memorial was exemplary for the time (it was established in 1959-1964) in some ways, including its area size, especially when compared to the low-key memorial site at Sobibor (or the old memorial at Belzec before its impressive recent complete reworking). 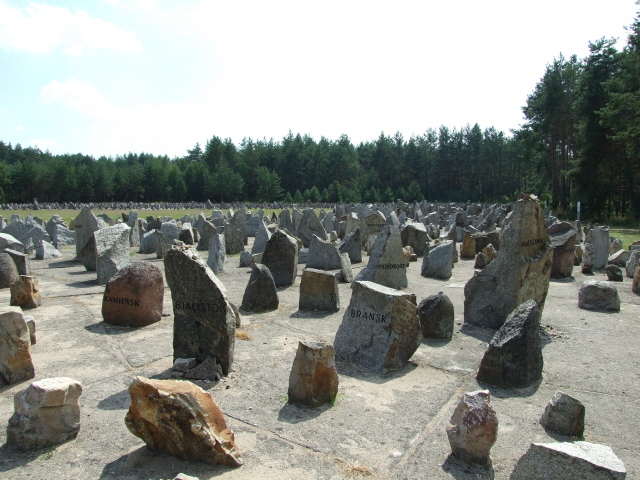 Of the perpetrators at Treblinka, a few were put on trial, but not until many years later. One of the first to go on trial in 1964/65 was the deputy commandant Kurt Franz, who after the war had lived and worked as a cook in Germany. Franz Stangl, camp commandant first at Sobibor, then from September 1942 to August 1943 at Treblinka (he had earlier served at the euthanasia centre at Schloss Hartheim) also survived the war and managed to flee to his native Austria. Here he was temporarily captured by the Americans, but later escaped before he could be put on trial. Via Syria he ended up in Brazil, where he worked at the Sao Paulo Volkswagen factory and was even registered under his real name with the Austrian consulate. It was not until 1967 that he was captured and extradited to West Germany. Showing no remorse, he was sentenced to life imprisonment in 1970, but died shortly before beginning his sentence in 1971. Of the survivors, the most prominent names are probably Richard Glazar and Samuel Willenberg. The former wrote the book "Trap with a Green Fence" about Treblinka and was also present as a witness at the Treblinka trials. The latter is the author of the book "Revolt at Treblinka" and is also known for his bronze statues depicting scenes from the ordeals at the camp. 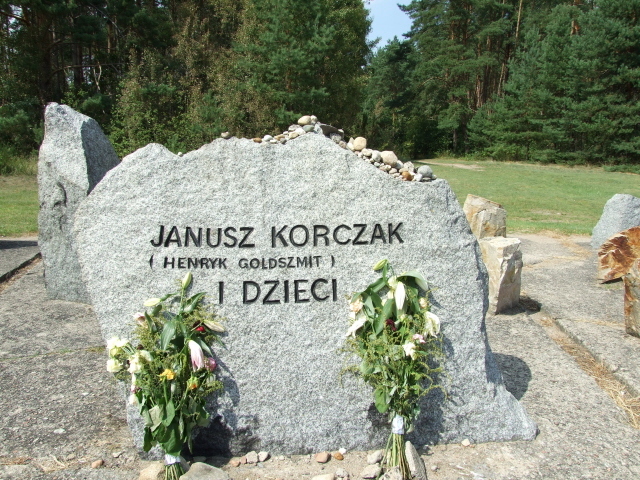 Of the victims who perished at Treblinka, the best-known name is probably that of Janusz Korczak, a renowned reformist pedagogue, who ran a Jewish orphanage in Warsaw (which is still there), and who despite being given the chance to escape did not desert his children and was thus sent into the gas chambers of Treblinka together with them. 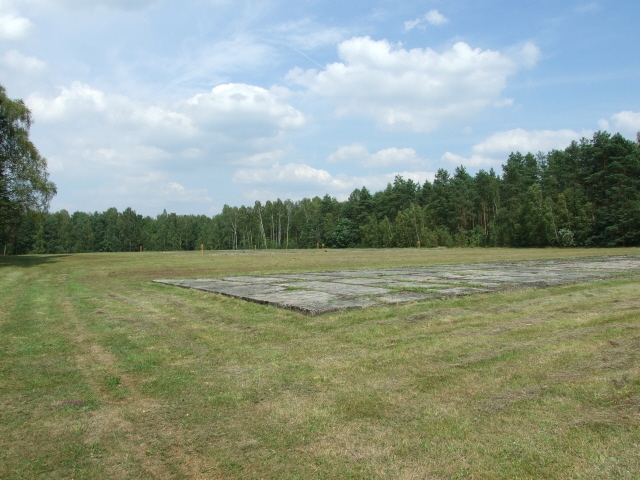 What there is to see: nothing at all remains of the original death camp part of Treblinka II, and only rudimentary ruins of the labour camp of Treblinka 1 are still in place. But the stunning layout of the early 1960s memorials makes up for that. From the car park a signposted path leads along a few memorial stones to the site of the former gate, marked today by a set of memorial stones. Behind that the path continues along the course of one of the former railway lines that served the camp. This is symbolized by a row of parallel oblong blocks of concrete reminiscent of railway sleepers. These end at a similarly symbolic 'ramp', i.e. the railway sidings where the victims had to disembark from the incoming trains. 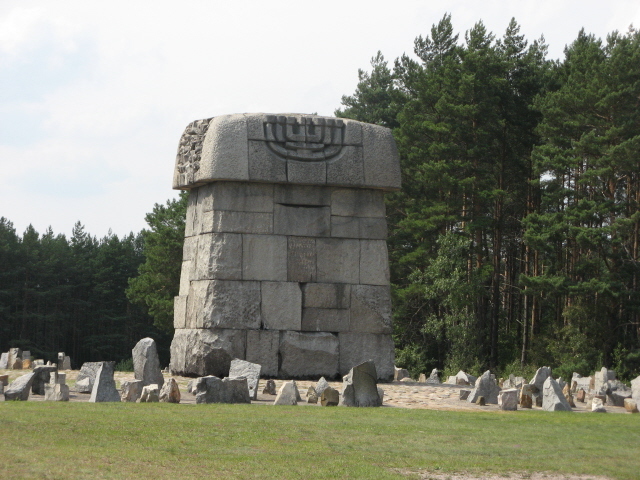 The centrepiece of the Treblinka memorial is a large granite monument at the site where the gas chambers would (presumably) have stood. Note the engraving of a menorah on the back of the monument – for once a clear indication that the victims were almost exclusively Jews. This had not normally been pointed out at the Holocaust memorials in the former Eastern Bloc (cf. Auschwitz, Belzec, Buchenwald etc.). Close to the central monument a stone engraving in several languages admonishes "never again". Not far from this is a single personalized stone – with the name of Janusz Korczak on it (see above and Korczak orphanage in Warsaw). Behind the main monument there's another, rather odd space – a low rectangular blackened area with what looks like melted tar on top (apparently the material is basalt). This is to symbolize the cremation pits. By the entrance to this main field, a few panels with photos have been put up. 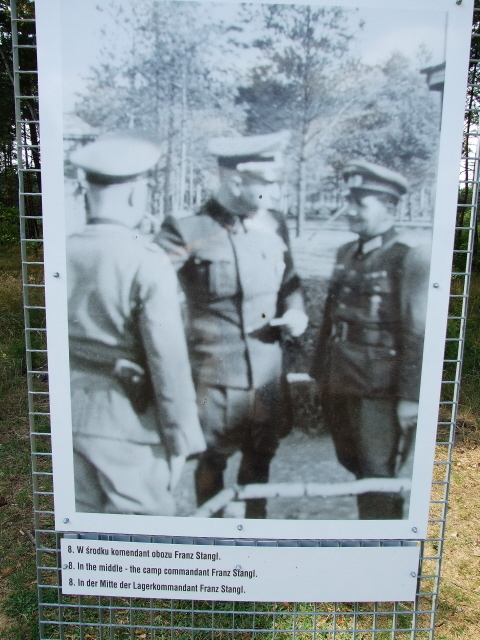 These photos show images of the digging of mass graves, SS living quarters and some of the perpetrators, including camp commandant Franz Stangl. The accompanying inscriptions are in Polish, English and German. Upright stone blocks mark the outer boundaries of the former camp. 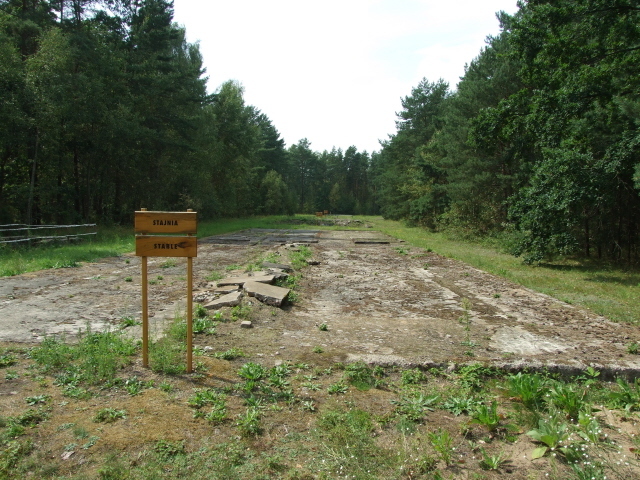 From the entrance to the former death camp area a dirt track leads about a mile and a half (2.5 km) further into the woods – namely to the site of the former labour camp Treblinka 1. En route you pass the hollow of the gravel pit (now overgrown) that the inmates were forced to work in. 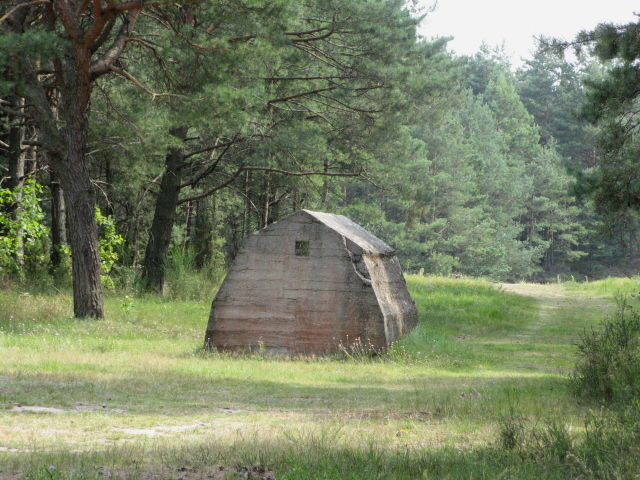 Nearby a small guards' bunker can be seen by the road. Next you pass the foundations of some works buildings and stables until you reach the grounds of the labour camp. Today this is marked by a grassy clearing with only the foundations of the barracks visible, as well as the remains of a well and the kitchen building's basement. Further into the woods there are several memorials (in particular at the 'executions' site) together with rows of crosses. Back near the car park, there's also a small museum about the camp. In it some original objects found within the area of the former camp are displayed, such as pieces of barbed wire, rusty scissors, fragments of Hebrew texts, etc. – these objects are labelled in Polish, English and French. A large part of the museum's content is – remarkably – the work of a small group of students from a German secondary school, the outcome of a project primarily conducted at the Memorial Centre at Majdanek. The text and photo panels of this part are in German and Polish only. However, at the small souvenir kiosk by the car park you can buy a brochure that contains these panels in English and French translations. So better get this before going to see the exhibition in the museum. 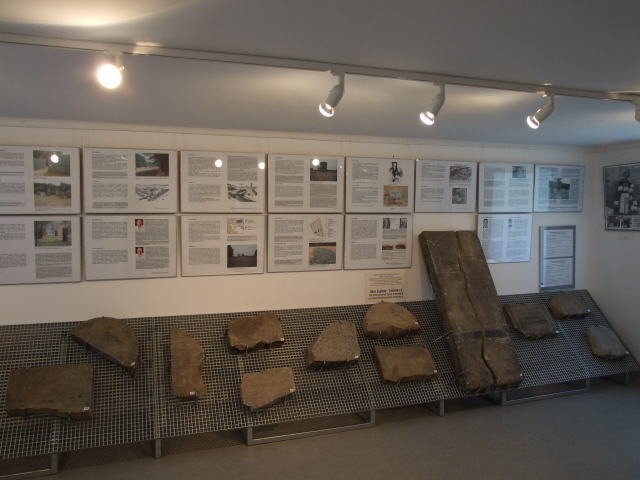 It provides a very good overview and summary of the camp's history. All in all, even though commodification in terms of museum-form interpretation and information is rather meagre at this memorial site, its layout and design as such are very convincing. It cannot quite compete with the much newer redesign of Belzec, which has somewhat more drama as well as appropriate modern commodification. 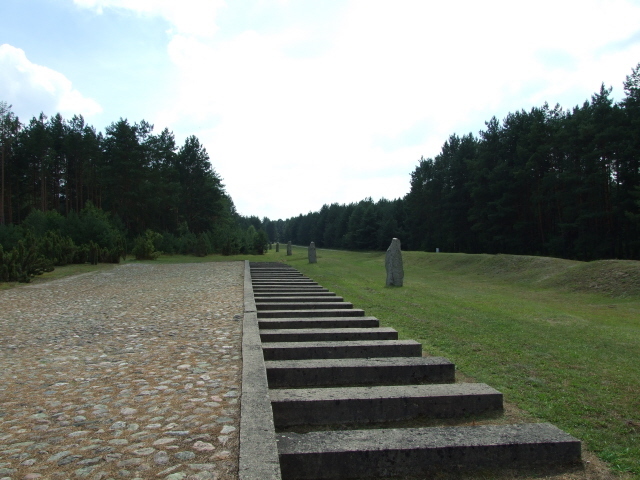 But Treblinka's greater size, some degree of personalization (esp. Korczak) together with the simple spaciousness of the fields of stones (plus the tiny museum) strike a very good balance conducive to the kind of sombre commemoration this extremely grim place deserves. Though not exactly shocking in its design it is still one of the most deeply affecting memorials of all the hundreds I have visited all over the world. You have to know what you are dealing with before you get here, however. Only then will you get the proper sense of this sinister place. Location: in eastern Poland, about 70 miles (110 km) north-east from Warsaw, off the route towards Bialystok. Access and costs: Remote and not easy to get to; but otherwise inexpensive/free. Details: the predictably remote location of the former camp in the east of Poland is not so easily accessible unless you have your own means of transport or are on an organized tour. 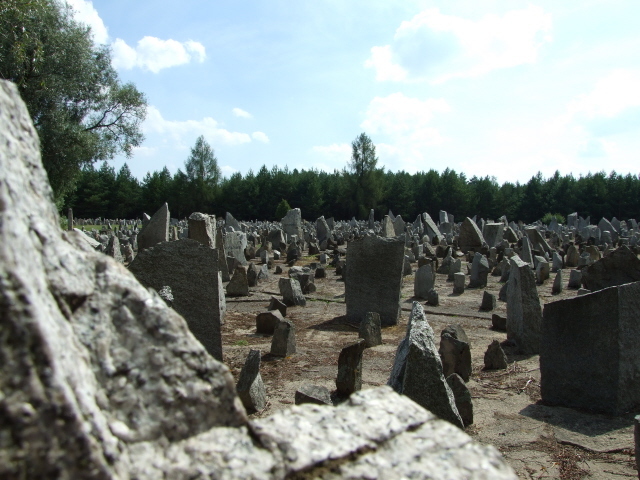 Tours are frequently run especially by Jewish 'roots travel' organizations, as well as individual general tour operators from Warsaw – however, these are costly: ca. 1000 zloty for an individual (less if sharing in a ghroup). The only way of getting there by regular public transport is to take a train to Malkinia (from Warsaw or Bialystok) and then hitching or taking a taxi to the site some five miles (8 km) away; but this may currently not be a viable option due to the road closure south of Malkinia (see below). 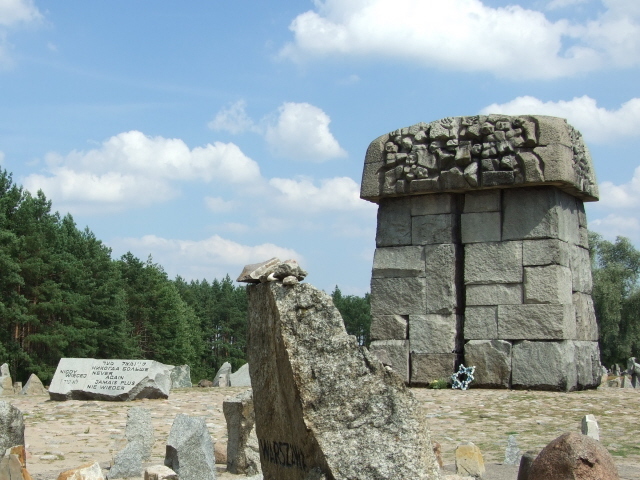 Note that the village called Treblinka is still well over two miles (3.5 km) from the actual site of the camp – so don't go there, make sure you make clear that it's the memorial you want to see. If driving in your own (or hired) vehicle from Warsaw, the most obvious route is via the No. 8/E67 trunk road towards Bialystok and then to branch off that route about 10 miles (15 km) past Wyszkow to the right into country road No. 694 leading towards Brok and Malkinia Gorna. At Malkinia the 677 road would have branched off to take you on the shortest route to the memorial site, but when I visited in August 2008, that road was closed. Maybe that allegedly creaking old bridge over the River Bug which I had read about in older references had finally become too precarious … In any case, given that there are no other bridges crossing the river nearby, I was forced to take a long detour, first further along the 694 towards Nur, then via the main road No. 63 southbound, and then at Ceranow off onto the 695, which eventually reconnects with the 677 at Kosow Lacki and finally looped back into the direction of the Treblinka memorial site. The extra detour (and some heavy roadwork activity on the No. 8 trunk road out of Warsaw) doubled the estimated journey time of one and a half hours to nearly three hours. Unless the more direct access road from Malkinia has reopened by now (if anybody knows about this please contact me! ), it may be worth considering a different route, going east first, e.g. on the 637 via Wegrow and Sokolow Podlaski and taking the 677 north from there. 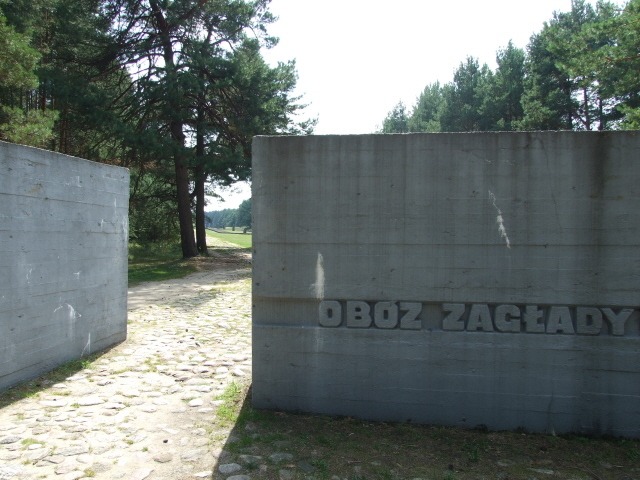 When driving from Lublin (see Majdanek) or Sobibor, you'd get to this point via the No. 63 through road anyway. 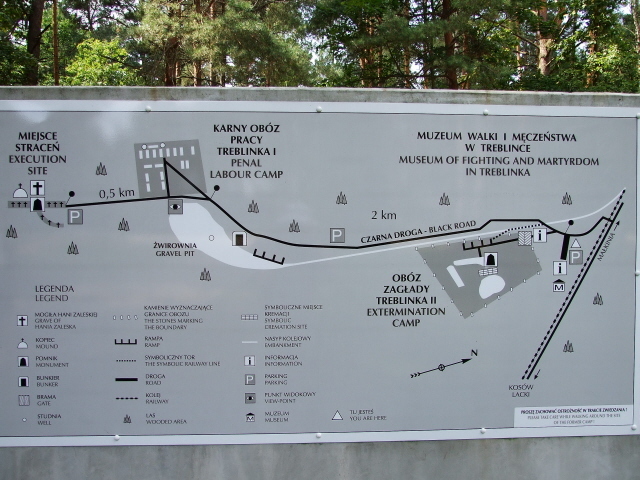 Opening times of the museum: daily from 9 a.m. to 7 p.m.
To get from there to the sites and relics of Treblinka 1 you can either walk (if you have time) or drive along the dirt track. I wasn't sure whether driving was allowed, but I asked at the shop and was told it was OK.
Time required: Visiting the main memorial site of Treblinka II should normally take no more than an hour (and could be done in less), but allow some extra time for the museum, which is small enough to do in ca. half an hour (if that) – but that will depend on whether you can read Polish or German (or whether you have obtained the brochure with the English translation available at the kiosk by the car park). 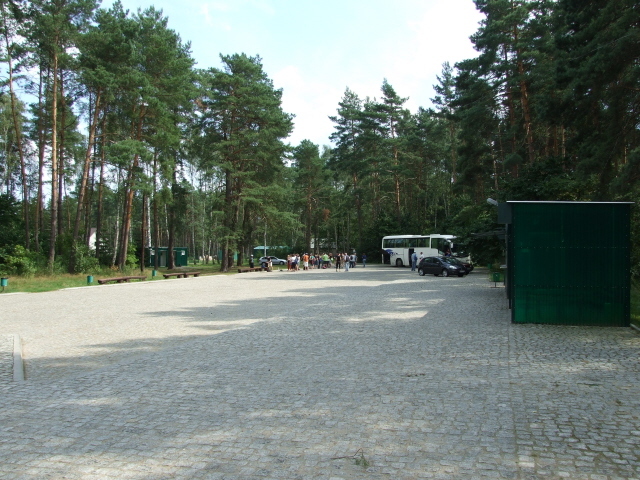 Getting to the other memorial sites of the former Treblinka 1 labour camp can mean significant extra visiting time, especially if it means walking the whole distance. Combinations with other dark destinations: In general see under Poland. 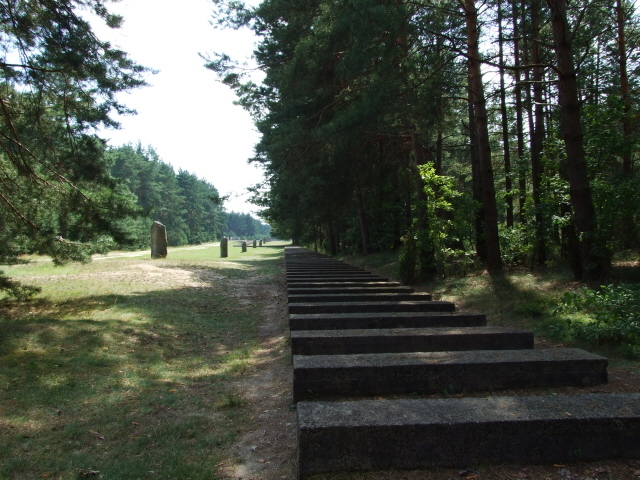 Treblinka can be visited as a day-trip from Warsaw, or slotted in en route to other places: e.g. when heading on north-east to Bialystok and Suwalki, or north to Gierloz (see Wolfschanze). You could also do a loop via Treblinka from Warsaw to Lublin (or vice versa). Lublin itself is a good base from which to visit nearby Majdanek, or, further afield, the sites of the other two Operation Reinhard death camps at Sobibor and Belzec. Combinations with non-dark destinations: there's nothing much in the vicinity of Treblinka, except for the comparatively unassuming scenic beauty of the Nadbuzanski Park Krajobrazowy (Bug landscape park), a large protected woodland area that stretches out along the southern banks of the River Bug. But this is not particularly developed for tourism. Further north, however, one of Poland's prime tourism draws, the Masurian Lakes, is within reach. And further east lies the primeval forest wilderness of the Bialowieza national park with its wild bison population. See also under Suwalki.